SEATTLE -- A U.S. judge on Friday imposed a nationwide hold on President Donald Trump’s ban on travelers and immigrants from seven countries, siding with two states that had challenged the executive order that has launched legal battles across the country. U.S. District Judge James Robart in Seattle ruled that Washington state and Minnesota had standing to challenge Trump’s order, which government lawyers disputed, and said they showed their case was likely to succeed. About 60,000 people from the affected countries had their visas cancelled. CBS News’ Paula Reid said the order, for the time being, effectively rescinds the Trump executive action, putting on hold the most controversial provisions of the law - including suspending entry of immigrants and nonimmigrants from the relevant counties; banning of refugees from certain countries; giving preference for some refugees based on religion; and banning of Syrian refugees. It wasn’t immediately clear what happens next for people who had waited years to receive visas to come to America, but an internal email circulated among Homeland Security officials told employees to comply with the ruling immediately. This temporary restraining order will remain in place as Robart considers a Washington state lawsuit against Trump’s ban, CBS affiliate KIRO reports. If the lawsuit wins, the executive order could be permanently invalidated nationwide. Meanwhile, in a seemingly contradictory ruling, a federal judge in Boston refused to extend a temporary injunction against Mr. Trump’s travel ban. U.S. District Judge Nathaniel Gorton late Friday declined to renew an order prohibiting the detention or removal of persons as part of Trump’s executive order on refugees and immigrants. That means his seven-day, temporary injunction granted Jan. 29 will expire as scheduled Sunday. Legal battles are playing out across the U.S. as opponents of the travel ban on citizens from seven predominantly Muslim nations take their fight to the courtroom. In the 21-page ruling, Gorton wrote that the lawsuit is “moot” because the people named in the lawsuit are legal permanent residents, and they do not need the protection of a restraining order, The Boston Globe reports. Since the signing of the travel ban last week, the White House has said the executive order does not apply to legal permanent residents. 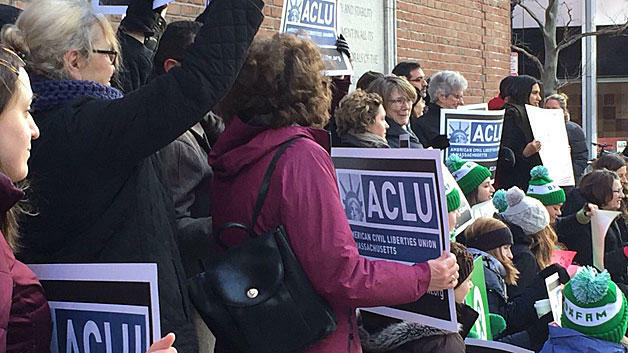 A temporary restraining order had been placed last week after the American Civil Liberties Union sued on behalf of two University of Massachusetts-Dartmouth professors detained at Logan Airport as they returned from an academic conference. The professors, both Iranian Muslims and lawful permanent U.S. residents, were eventually allowed to re-enter. Gorton’s Friday ruling is a victory for the Trump administration, especially since Gorton wrote that Mr. Trump has “broad powers” to decide who can enter the country. By denying the stay, the city must enforce Trump’s order when the temporary block expires Sunday, CBS Boston reports. The ACLU said it’s deeply disappointed in this decision. Other plaintiffs included international aid group Oxfam America and several non-citizens living in the U.S. legally. In a related development, the State Department said Friday that up to 60,000 foreigners from seven majority-Muslim countries had their visas canceled after the executive order. That figure contradicts a Justice Department lawyer’s statement Friday during a court hearing in Virginia about the ban. The lawyer in that case said that about 100,000 visas had been revoked. Legal battles are playing out across the U.S. as opponents of President Donald Trump’s travel ban on citizens from seven predominantly Muslim nations take their fight to the courtroom. Hearings were being held Friday in a few of the cases. Lawyers for the U.S. government argued the states don’t have standing to challenge the order and said Congress gave the president authority to make decisions on national security and admitting immigrants. Washington Attorney General Bob Ferguson had sued, saying the order is causing significant harm to residents and effectively mandates discrimination. Minnesota joined the suit this week. A judge is allowing Virginia to join a lawsuit challenging the travel ban. Friday’s ruling by U.S. District Judge Leonie Brinkema greatly expands the scope of the lawsuit, which was initially focused only on legal permanent residents, commonly called green-card holders. Brinkema indicated a willingness to consider cases involving anyone who had been issued a visa and had it revoked. A government lawyer in the case said more than 100,000 people have had visas revoked since the ban went into effect, but the State Department later said the number was close to 60,000. The higher figure included visas that were actually exempted by the travel ban, as well as expired visas. U.S. District Judge Nathaniel Gorton late Friday refused to renew an order prohibiting the detention or removal of persons as part of Trump’s executive order on refugees and immigrants. That means the seven-day, temporary injunction granted Jan. 29 will expire as scheduled Sunday. Hawaii is suing the federal government to stop President Donald Trump’s travel ban on people from seven majority Muslim countries. Attorney General Doug Chin says Trump’s executive order keeps Hawaii families apart and keeps residents from traveling. He says it degrades values Hawaii has worked hard to protect. Chin says the order also will make foreign travelers feel unwelcome, which is a problem for Hawaii’s tourism-powered economy. Hawaii filed the lawsuit in federal court in Honolulu on Friday. A Brooklyn judge on Thursday extended a temporary restraining order to Feb. 21, but the Justice Department said it will ask her to throw out the case. U.S. District Judge Carol Amon’s ruling extended a stay that had been issued Saturday by a different judge and would have expired Feb. 11. Amon extended the order to give more time the government and civil liberties organizations to file paperwork. A federal judge in Detroit says U.S. green-card holders shouldn’t be affected by the order. The Arab-American Civil Rights League argued in a suit filed this week in Detroit’s U.S. District Court that the executive action is unconstitutional and targets immigrant communities. A restraining order released Friday from U.S. District Judge Victoria Roberts covers legal permanent residents, not some others that also are part of the lawsuit. She says lawyers for the government clarified to her that the ban doesn’t apply to “lawful” permanent residents. Three California university students are challenging the ban. Their federal suit, filed Thursday in San Francisco, says the ban is unconstitutional and has created hardships for the students. It alleges that a freshman at Stanford University now can’t visit her husband in Yemen; another Yemeni at San Diego’s Grossmont College can’t resume studies there; and an unidentified University of California Berkeley doctoral candidate from Iran fears losing a job opportunity.